The past two days of this year’s NCAA tournament have been filled with upsets, close calls, and nail biting finishes. 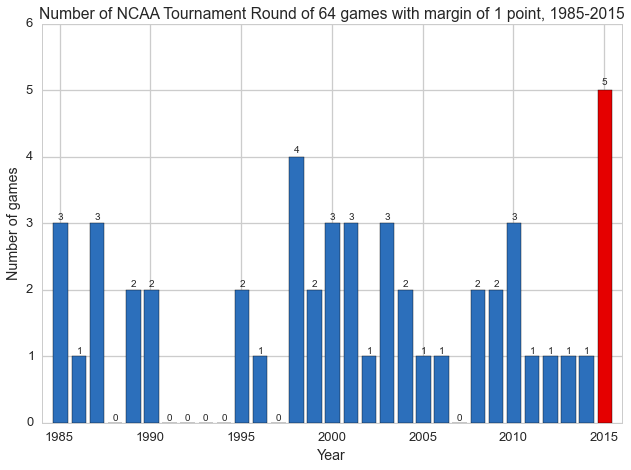 This round of 64 has been so exciting that I began to wonder how close the games of the 2015 tournament have been relative to prior years. Thanks to the folks over at Kaggle, who assembled a historical dataset for their Machine Learning March Mania contest, I was able to take a look at tournaments back to 1985. 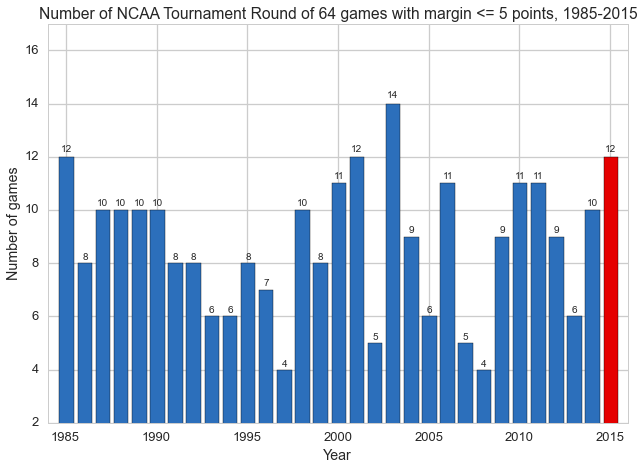 In particular, I decided to take games from the round of 64 and look at the difference in scores between the two teams, or so-called “margin of victory”, to see how it has evolved over time and just how close the games this year have been. One thing you have probably already noticed is that there were quite a few one-point games this year. In fact, 2015 boasts the most one-point games in the round of 64 ever, with five! As we see in the figure above, we are particularly spoiled this year because the last four tournaments in a row have featured only a single one-point margin in the round of 64. The next highest number happened all the way back in 1998 with four one-point games. The 2015 Round of 64 is indeed shaping up to be a pretty unique tournament! The 2015 tournament is tied for second place at twelve close games with 2001 and 1985. Only 2003 had more close games, with fourteen. 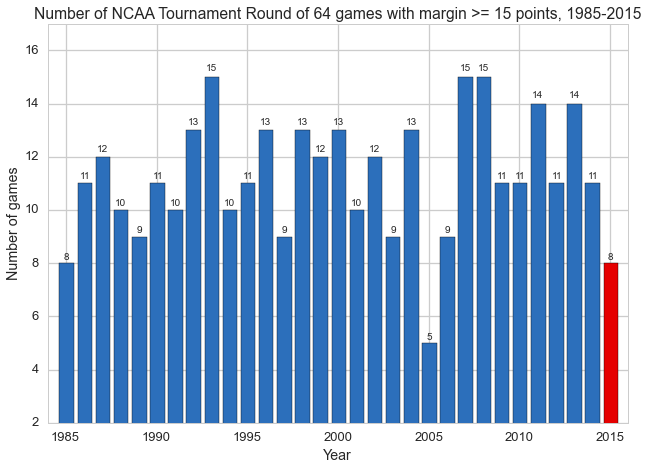 Additionally, the 2015 tournament is tied with 1985 for the second lowest number of blowout games, with only eight games having a margin of fifteen or more points. Finally, let’s get a sense for the overall trends by taking a look at the mean and median margin of victory. We can see here that the average margin of victory for the 2015 tournament is the fourth lowest ever at 10.7 points. 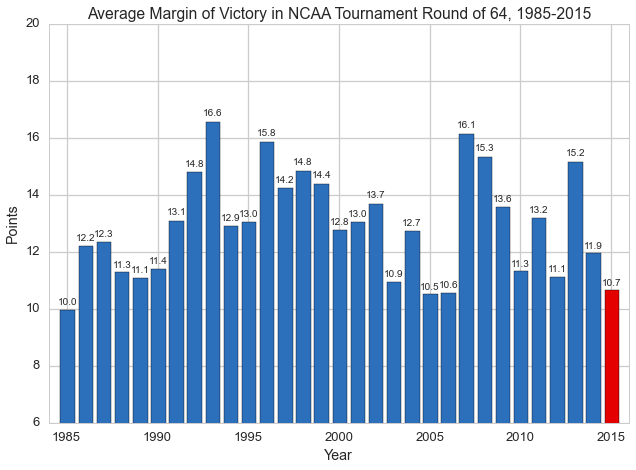 You have to go back to the 2005 and 2006 tournaments to see lower averages, and before that all the way back to the 1985 tournament. 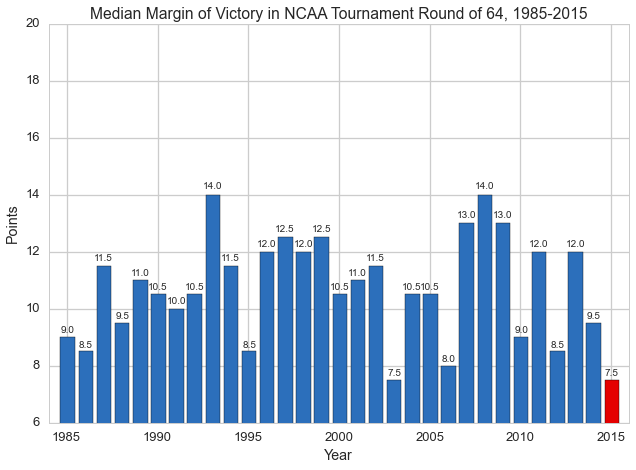 Additionally, the 2015 tournament is tied with the 2003 tournament for the lowest median margin of victory ever, at 7.5 points. The past two days of NCAA tournament action have definitely been a gift from the basketball gods. The stats show that they are definitely the closest round of 64 games in recent memory. They also rank as some of the closest of the past 30 years. I can’t wait to see what the rest of the tournament has in store for us. What are the Chances Your Team Knocks Off Kentucky? 3/31/15…..Henry and ‘CREW’, This page is ausum…….and coming from HARVARD too…..GOOD JOB ALL….